Desperately on the trail of his missing son, an old Confederate solider will stop at nothing to reunite the remnants of his family, even if he has to slay every trace of Utgard filth along the way. Finding unexpected companionship in a young orphan, the gunslinger closes in on the god responsible - Thurs, he who hails beyond the stars. If I wasn't so pessimistic about book to movie adaptations, I'd say this would make a brilliant film - in fact, I imagined it as such; Lawson's stunning use of words did wonders to create vivid imagery inside my head. I found myself thoroughly impressed by the intelligent, highly attractive prose, and by how each scene seamlessly came together to tell an exciting yet ultimately tragic tale. Despite being a short novel of less than two hundred pages, it expressed itself with a lot more substance than other full-length books I've read. A part of me wishes it was longer, but I realise it may have lessened the overall impact. The character of the "old man" was probably the pinnacle; he was so utterly badass, and believe me when I say I don't use that term lightly. Smart, skilled, and completely unapologetic about his paternal devotion - he's someone I won't forget anytime soon. I'm not saying he was a perfect man, far from it, but he owned every scene he was in. He was the sort of being that would draw an entire room to his entrance, and not just because of his (suspiciously) large size. Emmett, however, whilst starting out with good intentions, truly lost his way as he succumbed to the unsavoury power of Utgard. I could relate with him in a way, in that I'm well aware of the pain of watching a parent slowly fade away. Nothing compares to that feeling of hopelessness, and if given the same opportunity, I'd have likely welcomed the same solution. As with all books I read, I tend to look deeper into things; for meaning in aspects that are probably meaningless. Both Emmett and his father shared a particular trait of being tall, bulky and at times, questionably strong. The fact that Utgard's a stronghold of giants, I was left contemplating a connection. Could it be, that the old man's ancestry is intermingled with otherworldly blood? If anything, at least, I can have my theories, incorrect and insignificant as they may be! I can't say the Old Western theme has ever appealed to me, but I now feel inclined to seek out similar tales. Of course, few, if any, are going to have such a factual and accurate setting seeped in unforgiving folklore. The historic element of the American Civil War worked wonderfully with the touch of Norse and Native American mythology, and I was impressed with the knowledge poured into it. Either Lawson did his homework, or he simply knows his stuff. I also loved the brutality of the surrounding world- cannibals and witches, oh my! Seriously, sometimes witchcraft should be punishing, rather than glamorous. In conclusion: The unnamed hero has been one of the coolest characters I've ever had the pleasure to read about. 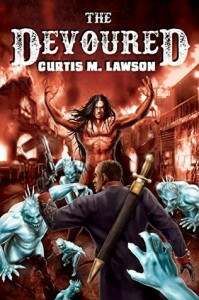 Whilst including both history and the supernatural, Lawson makes a short novel seem like an epic best-seller. "Thought - critical, logical thought - that's what separates a man from an animal. That's what keeps us progressing further and further. That ability to think our way around any and every problem is why the Devourers fear us." "And what about memory?" Hank asked. "Memory is what keeps us strong in the toughest times, and it's what prevents us from becoming monsters when our hands are forced to kill. It's the memories of love and happiness that let us come home from the dark places where the world sometimes takes us. It's memory that lets a man find the strength to fight the gods themselves for what's right."